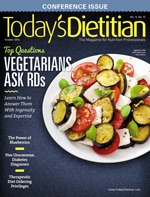 Today’s Dietitian reviews their underlying pathology and how they’re diagnosed and classified and offers strategies for nutrition intervention. After months of battling a yeast infection, Cherise finally sought medical attention. During her appointment with a nurse practitioner, Cherise described her symptoms. The nurse checked her blood glucose level and discovered it was 400 mg/dL. The nurse told Cherise she couldn’t fight the yeast infection because of her elevated blood glucose and that she had type 2 diabetes. Shocked about her diagnosis, she vowed to “follow the rules, eat right, and exercise,” after witnessing how the disease took its toll on her stepfather who didn’t take care of himself. Pending the results of her lab test to confirm the diagnosis, her doctor prescribed metformin to stabilize her blood sugar. Her lab results came back inconclusive. “My C-peptide level was normal, indicating I was making insulin on my own, which is uncommon in patients with type 2 [diabetes]. I wasn’t overweight either—a more common aspect of type 2 diabetes,” Cherise says. Cherise was referred to an endocrinologist who ordered additional blood work. The results showed glutamate decarboxylase (GAD) antibodies in her blood, confirming the diagnosis of type 1.5, also known as latent autoimmune diabetes in adults (LADA). She wondered how she developed this disease since she didn’t have any biological family members with diabetes. Her endocrinologist said it was genetic and could have been triggered by a cold or even stress. The doctor prescribed 5 mg of Glipizide and told her she’d probably be on insulin within the next four years. Cherise controlled her blood glucose levels for almost three years through diet, exercise, and oral antidiabetes medication, but eventually her blood glucose levels rose and she began insulin therapy just as her doctor predicted. “Nothing could have prepared me,” she says. “I felt as if there was something I did wrong.” This is a sentiment shared by many who are diagnosed with LADA. Although LADA shares characteristics with both type 1 and type 2 diabetes, there are clinical distinctions that can be observed. “Those with LADA don’t typically fit the profile of someone who has type 2 diabetes,” says Shelly Wishnick, RD, CDN, CDE, of Mount Sinai Beth Israel Friedman Diabetes Institute in New York City. “They don’t have high blood pressure or high cholesterol, are typically active and at a healthy weight, and have no family history of type 2 diabetes,” she says, noting that these individuals may have a family history of autoimmune disease such as thyroid disease or rheumatoid arthritis. Initially, individuals can control LADA with dietary modifications, but usually within a short period of time—months, sometimes years—patients will need oral medication and insulin therapy.3 Ultimately, clinical features of LADA include weight loss, propensity for ketosis, unstable blood glucose, and low C-peptide levels—a byproduct created when insulin is produced.3 “However, patients [with LADA] can still have measurable C-peptide levels for many years after diagnosis,” Wishnick says. MODY can be confused with type 1 or type 2 diabetes, however, “Clinically we do not see the features such as abdominal obesity, hypertension, acanthosis nigricans, or hyperlipidemia that are common with insulin resistance and type 2 diabetes,” says Despina Hyde, MS, RD, CDN, CDE, of the New York University Langone Weight Management Program in New York City. Unlike people with type 1 diabetes, who always require insulin, people with MODY often can be treated with oral diabetes medications. “Like other forms of diabetes, it’s important to maintain blood glucose control in patients with MODY. The complications of hyperglycemia such as kidney disease, vascular damage, and blindness are important to consider with MODY as well,” Hyde says. Injuries to the pancreas from trauma or diseases such as cystic fibrosis can damage the pancreas enough to cause diabetes.4 Cystic fibrosis is an inherited disease of the mucus and sweat glands. The primary complication in cystic fibrosis is chronic pulmonary disease. However, up to 75% of adults with cystic fibrosis develop glucose intolerance, and nearly 15% have CFRD.6 In fact, CFRD is the most common comorbidity in people with cystic fibrosis.7 “[This is] in part because people with cystic fibrosis are living longer lives due to better treatments and may experience more pancreatic damage as they age,” says New York–based dietitian, Susan Weiner, MS, RD, CDN, CDE, author of The Complete Diabetes Organizer: Your Guide to a Less Stressful and More Manageable Diabetes Life. According to the American Diabetes Association’s 2009 Clinical Care Guidelines for Cystic Fibrosis–Related Diabetes, during a period of stable health, a CFRD diagnosis can be made in cystic fibrosis patients according to the usual glucose criteria. During periods of acute illness, a CFRD diagnosis can be made when fasting plasma glucose levels at or above 126 mg/dL (7.0 mmol/L), or two-hour postprandial plasma glucose levels at or above 200 mg/dL (11.1 mmol/L) persist for more than 48 hours. Individualized based on weight gain and growth targets. 1.2 to 1.5 times the dietary reference intake (DRI) for age. Individualized to achieve glycemic control. Artificial sweeteners may not be beneficial due to lower calorie content. High-fat diet comprising 35% to 40% of total calories is necessary for weight maintenance. Type of fat isn’t important. Approximately 1.5 to 2 times the DRI for age; no adjustment required for nephropathy. No sodium restriction. Liberal, high-salt diet, particularly in warm conditions and/or during exercise. Supplement diet with cystic fibrosis–specific multivitamin formulation or a multivitamin and the additional fat-soluble vitamins, including A, D, E, and K.
Because of the higher prevalence of liver disease in cystic fibrosis and possible use of hepatotoxic drugs, alcohol use must be discussed with physician. No calorie or carbohydrate restriction; adequate calories for weight gain. Weight loss not necessary. Carbohydrates should be spread throughout the day; consume nutrient-dense beverages. Excessive cortisol production is what causes Cushing’s syndrome. Cortisol is a glucocorticoid hormone, an antagonist to insulin. In excess, glucocorticoid hormone causes increased glucose production due to stimulation of gluconeogenesis and insulin resistance in the liver and skeletal muscle, which reduces glycogen synthesis and glucose uptake. This generally occurs in individuals with preexisting defects in insulin secretion. “All patients with Cushing’s syndrome should be screened for diabetes on a regular basis and blood glucose levels tested at regular medical appointments,” Weiner says. Hyperglycemia usually resolves when the glucocorticoid levels are normalized.9 However, patients who develop diabetes due to exogenously administered glucocorticoids may require insulin therapy for the time they’re receiving high doses of glucocorticoids. Diabetes resulting from antiretroviral therapy used for HIV treatment is referred to as antiretroviral-associated diabetes.10 Insulin resistance, hyperglycemia, and diabetes have been associated with highly active antiretroviral therapy (HAART) used to treat HIV. HAART is based on the use of a drug class called protease inhibitors, which have been used extensively as antiretroviral agents. Protease inhibitors and nucleoside reverse transcriptase inhibitors (NRTIs) have been shown to cause antiretroviral-associated diabetes. “NRTIs also have been associated with an increased incidence of diabetes,” says Gonzalvo, referring to a prospective cohort study of more than 33,000 HIV-infected patients where the NRTIs stavudine, zidovudine, and didanosine all were associated with an increased incidence of new-onset diabetes.12 “Decreased mitochondrial function resulting in decreased insulin sensitivity appears to contribute to the development of diabetes in individuals taking NRTIs,” she says. A diagnosis of antiviral-associated diabetes doesn’t change the usual dietary recommendations for HIV-infected patients. Managing any type of diabetes can be challenging. But when combined with HIV, cystic fibrosis, or Cushing’s syndrome, managing diabetes can be even more difficult. “These uncommon types of diabetes may not be easily managed with lifestyle changes, but the patient should be reminded that stress reduction, healthy eating, and physical activity as appropriate may improve overall health,” Weiner says. Dietitians must keep in mind that if a patient doesn’t fit the typical type 2 diabetes profile, they may have MODY or LADA. Wisnick encourages dietitians to be their patients’ biggest advocates and to ask their endocrinologist to test them for GAD. Often, patients with LADA will blame themselves for the diagnosis, as in Cherise’s case, but dietitians must assure patients that it’s not their fault. To effectively empower diabetes patients, nutrition professionals must recognize the signs, symptoms, and classifications of the different types of diabetes and remember that nutrition intervention strategies must be individualized based on the American Diabetes Association’s 2013 Nutrition Guidelines. 1. National Diabetes Statistics, 2011. Centers for Disease Control and Prevention website. http://www.cdc.gov/diabetes/pubs/factsheet11.htm. Accessed July 22, 2014. 2. American Diabetes Association. Standards of medical practice - 2014. Diabetes Care. 2014;37(1):S14-S80. 3. American Association of Diabetes Educators. The Art & Science of DSME Desk Reference. Chicago, Illinois: AADE 2011. Ed: Carole Mensing. 4. Diabetes Overview. National Diabetes Information Clearing House website. http://diabetes.niddk.nih.gov/dm/pubs/overview/ - other. Accessed August 18, 2014. 5. Unger J. Latent autoimmune diabetes in adults. Am Fam Physician. 2010;81(7):843-847. 6. ADA/JDRF Type 1 Diabetes Sourcebook, Excerpt #1: Diagnosing Diabetes. Diabetes In Control website. http://www.diabetesincontrol.com/articles/85-/14583-adajdrf-type-1-diabetes-sourcebook-excerpt-1-diagnosing-diabetes. Updated May 5, 2013. Accessed July 22, 2014. 7. Moran A, Brunzell C, Cohen R, et al. Clinical care guidelines for cystic fibrosis–related diabetes. Diabetes Care. 2010;33(12):2697-2708. 8. Pivonello R, De Leo M, Vitale P, et al. Pathophysiology of diabetes mellitus in Cushing’s syndrome. Neuroendocrinology. 2010;92(1):77-81. 9. Mazziotti G, Gazzaruso C, Giustina A. Diabetes in Cushing syndrome: basic and clinical aspects. Trends in Endocrinology & Metabolism. 2011;22(12):499-506. 10. Kalra S, Kalra B, Agrawal N, Unnikrishnan AG. Understanding diabetes in patients with HIV/AIDS. Diabetol Metab Syndr. 2011;3(1):2. 11. Woerle HJ, Mariuz PR, Meyer C, et al. Mechanisms for the deterioration in glucose tolerance associated with HIV protease inhibitor regimens. Diabetes. 2003;52(4):918-925. 12. DeWit S, Sabin CA, Weber R, et al. Incidence and risk factors for new-onset diabetes in HIV-infected patients: the data collection on adverse events of anti-HIV drugs (D:A:D) study. Diabetes Care. 2008;31:1224-1229.